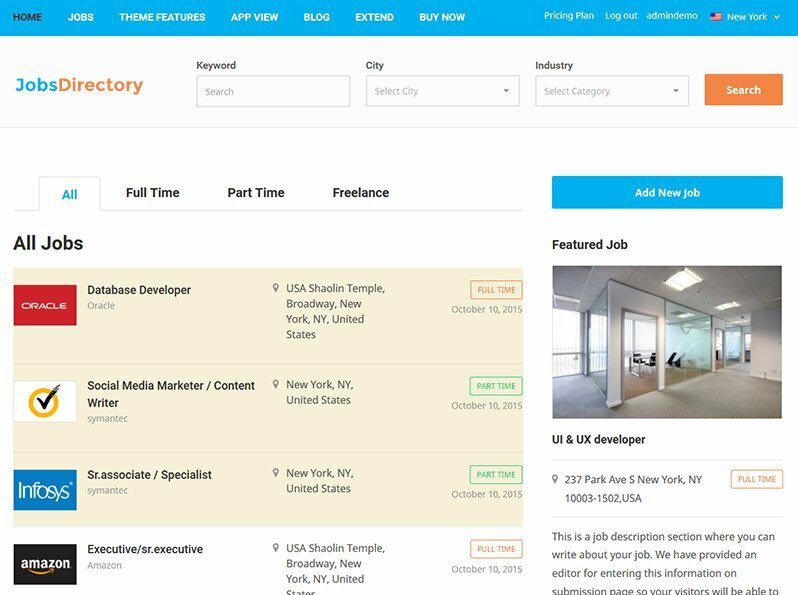 What is a Jobs Directory Theme? 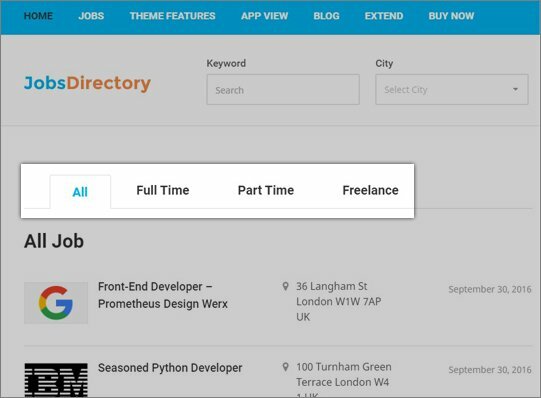 The JobsDirectory theme is a great way for employers and employment agencies to advertise jobs online. This is where you come in as a jobs portal owner. You are basically the link between employers and recruiters and jobseekers. Imagine you launch your website and start charging for job post submissions. Wouldn’t this be a great way to earn money? This theme has been designed with so many monetization options to maximize your earning potential through the job board website. One of these is the theme’s subscription type packages. Those are packages which charge a certain fee and allow a set number of job posts to be submitted. This online job portal theme also lets you create free job posting packages as well as premium ones. Job seekers often search for jobs from their mobile. Imagine if you miss this mobile traffic because your site is not responsive and visitors can’t view it properly and leave? Well, you don’t have to worry about that, JobsDirectory is responsive and it’s designed to look awesome on any device. As well as this, you can activate the mobile app view option instead. This is a great way to display your website and mobile visitors will love the ease of navigating your site. You can actually see this mobile app view on the action by clicking here from your mobile. 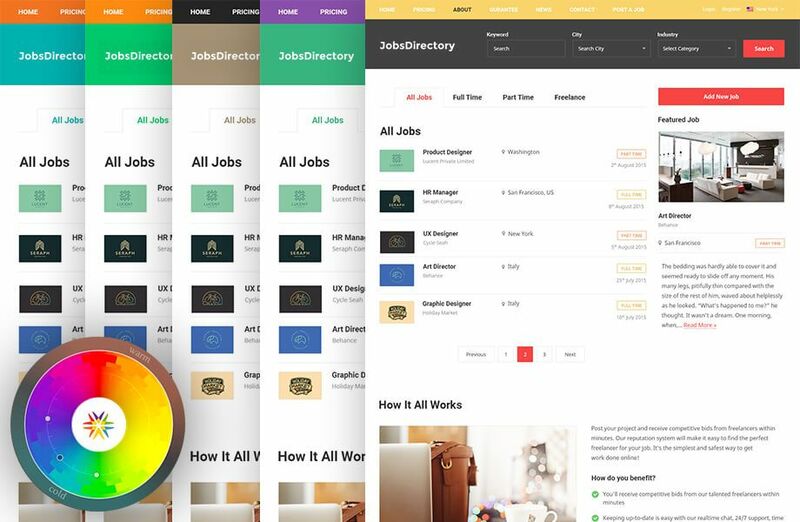 Creating a powerful job board is made easy with this jobs portal theme. What’s great is that you can customize the search fields. 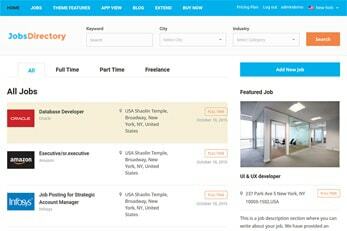 This makes it possible to use the theme for jobs in any industry and you can offer relevant advanced job search option. Make it easy for the job seekers to navigate around your job board and find out the relevant jobs. Having tabs for different job types is a great way to make your site more organized. 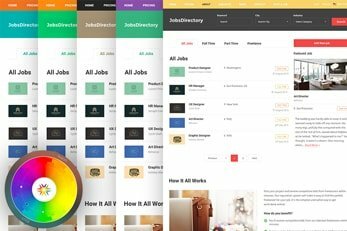 You can edit job type tabs straight from your admin dashboard and give your jobs website its unique job tabs. 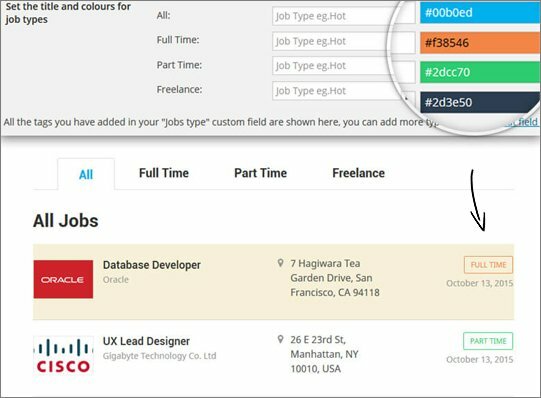 Offer job seekers even more easier navigation with color keys for different job types. 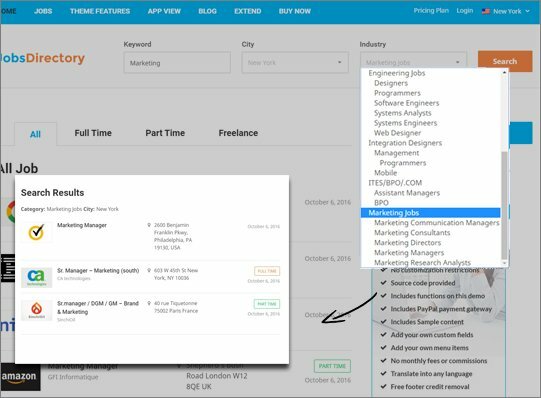 You can edit and even add more of these job type tabs to your job board website. This option is designed to display company/employer information in a clear and informative way. Did you think it costs thousands to launch a jobs portal? Well, it doesn’t because our WordPress job board theme comes at an affordable price. That’s not a compromise on all the powerful features either. 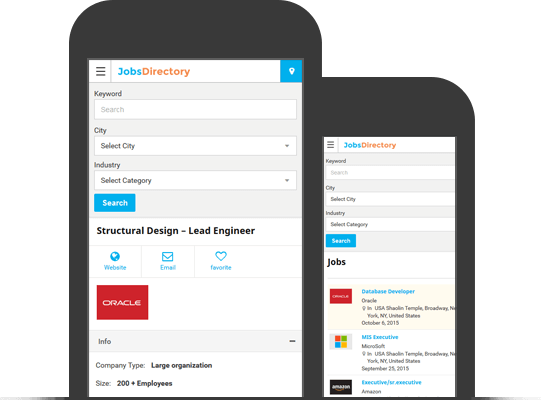 We’ve loaded Jobs Directory with so many features to help you build the best employment sites. 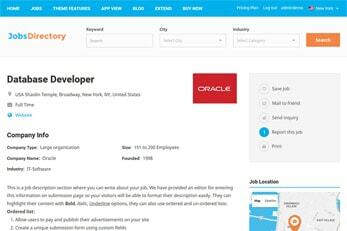 You will also find our job posting plugin included with this powerful software on the Standard or Developer license. Please see below just some of the powerful features you get with our Jobs Directory theme. 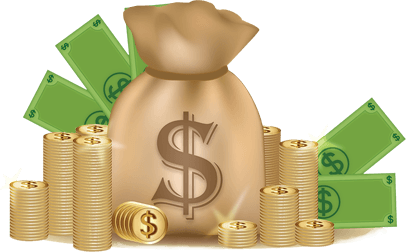 Banner ads or AdSense banners. Jobs Bulk Import/Export .CSV tool. 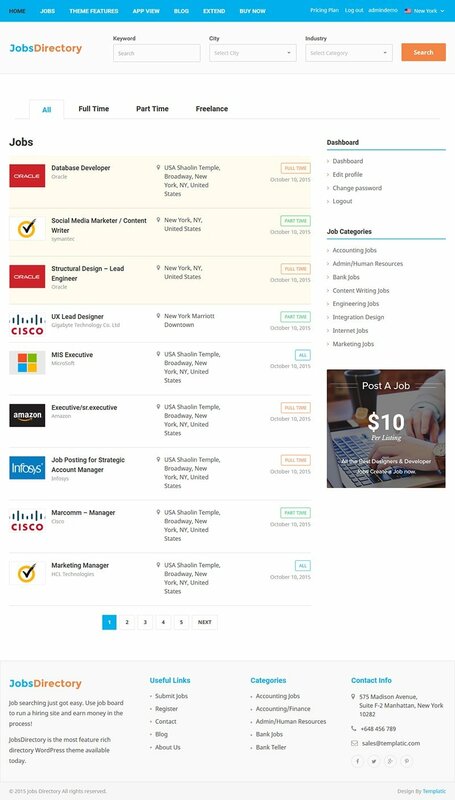 Extra charge for featured jobs on homepage or job categories. Extra charge specific job categories. This search engine friendly and easy to use job board theme has been built with SEO in mind. 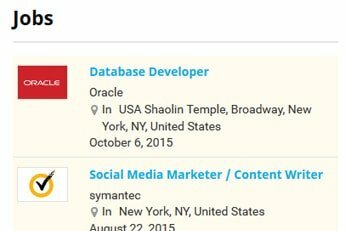 This makes it super easy for Google and other search engines to find job listings on your portal. 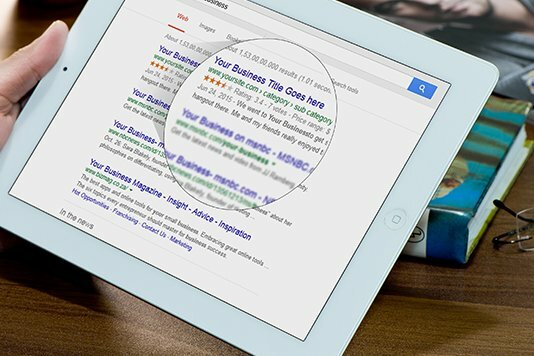 Our theme has been designed to work with the best SEO plugins around which are Yoast SEO, All in One SEO, Google XML Sitemaps and All In One Schema.org Rich Snippets for a search engine optimized job (SEO) portals. Create a multilingual jobs directory! As well as being able to translate this theme into any language instead of English, it’s also tested with popular WPML plugin. Using the WPML plugin on your jobs site lets turns it into a multi-lingual portal. The WPML plugin is not required to translate the theme into another language instead of English. You can do this with the provided .PO and .Mo files which come with the theme. You are not limited to just using the theme with its included plugins. You’ll find it’s compatible with many other popular plugins. We haven’t tested it with all plugins out there but below are just a few of the ones we’ve tested it with. These are just some of the features to give you a professional and powerful online jobs portal. Loaded with tons of settings and options to give you full control over your jobs portal. Customizable job post submission form for employers or recruitment agencies. 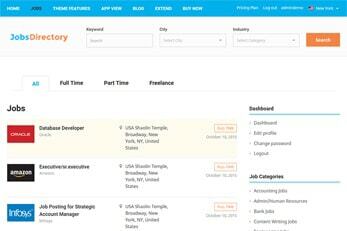 Customizable simple and advanced job search to let you control which fields are searchable. Various Google Maps including job details pages, job categories,search results and an all-in-one map. Create unlimited additional custom fields to shape your site’s submission form and job detail pages the way you like. Enable/disable user registrations. 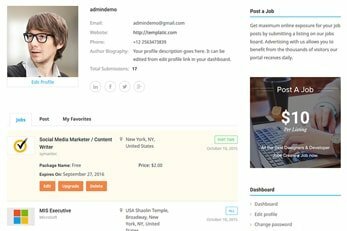 Easily manage users and their jobs from wp-admin. Dedicated user dashboard is provided each registered users and listing owner on your site. Includes a customizable job submission packages system with the PayPal payment gateway integrated. Various email notifications are sent at different events. Editable message templates. Theme colors can be customised from admin panel to match your color scheme. This amazingly powerful classified job engine theme comes with hundreds of built-in features. As well as this, you also have access to a large collection of extra resources we’ve compiled for you. These resources include some free add-ons for even more job management options. You will also find a list of compatible third party plugins, theme and plugin guides, 75+ tutorials more. 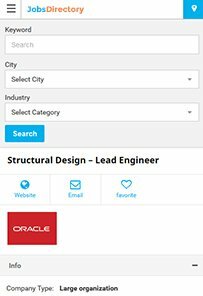 As well as the powerful features this job classified theme comes with such as: advanced job search, subscription job posting packages, single or multi-city, unlimited customer fields and categories, it also comes with its parent theme’s built-in features. 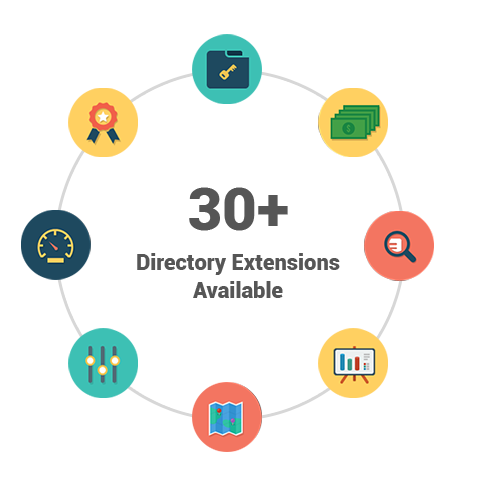 Moreover, we have a collection of more than 30 extensions using which you can extend the functionalities of your Jobs Directory site and make it even more powerful. You can use this great visual composer plugin to change the look of your job board. This powerful plugin lets you make changes with its intuitive front-end editor. So you can manage the design of your job search website without actually touching a line of code. The popular PayPal payment gateway is included with the Jobs Directory theme. This is an easy way for for job board websites to charge for job posting. Besides you can choose from 15+ compatible paid payment gateway add-ons. 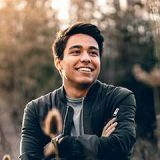 These optional add-ons help you accept payments to post job listing with more of some of the other popular payment gateways. Need to create a jobs portal for employers and jobseekers? Designed with many search filters, job functionalities, this job board WordPress theme is certainly the perfect solution for you. 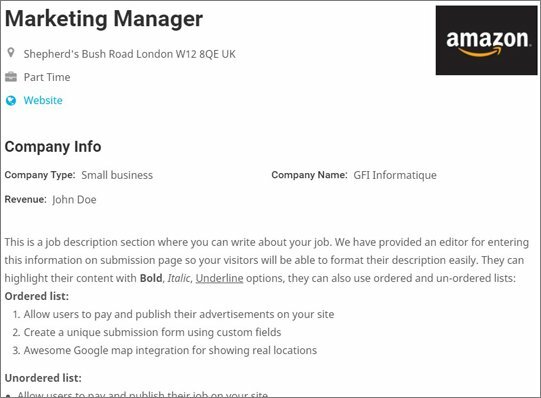 Start your job listing website today in style.